'Reveal' did have a couple of decent tracks tucked away on it though, but they were swamped by average songs and a production so brightly polished you needed shades. I've Been High was a lovely tune, featuring one of Stipe's most delicate vocals. I'll Take The Rain wasn't half bad either, while The Lifting could have been one of the album's standouts had an earlier version (that featured on the b-side of the awful lead single Imitation Of Life) been used instead. For some reason, someone had the idea that this should be the album that deserved the full remix treatment. A bunch of remixers were asked to contribute to the project and the best results were compiled by the band. 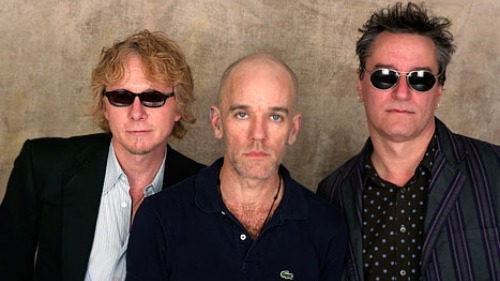 The result, titled 'r.e.m.IX', was released as a free download from the band's website in 2002. Thank god it was free because had I paid for it, I might well have hunted Stipe, Buck and Mills down and put them out of their misery once and for all. A bunch of insipid and uninspired versions of songs from 'Reveal' did not make me feel any better about the band I once adored. In fact it convinced me to move on. The album wasn't particularly well-received by the critics either, so whatever the initial aims for the project were, it was clear they had failed. I'm in slightly uncharted territory here. My knowledge of the later REM recordings is scant and very little of what I did hear bowled me over. I enjoyed these two tunes a great deal though. I'm not quite sure what that tells me - perhaps I should go back and give 'Reveal' another listen. Please....please.....please..........see the series through. I've loved hearing all this new stuff to my ears.